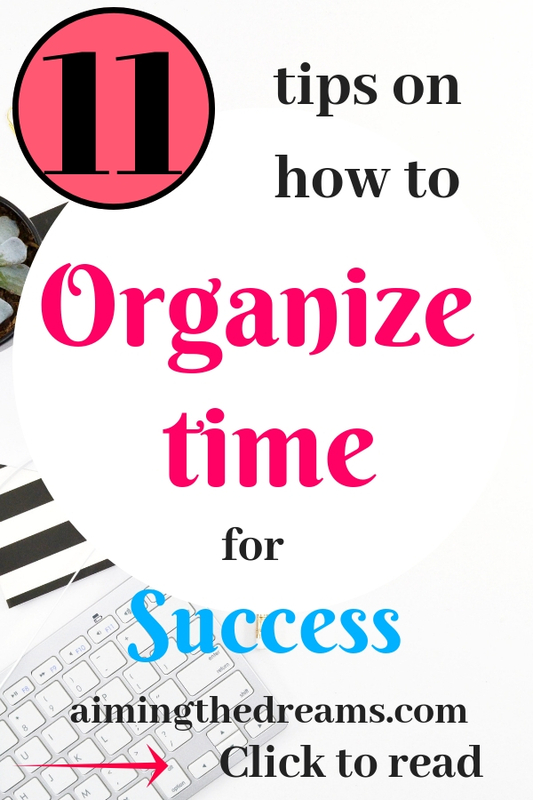 Organizing your time will help you gain success and eventually bring riches to you. Time management is life management. Is it correct. I think so. Because we all have limited time to live on this beautiful planet. We have to accomplish whatever we want, in this given time. Sometimes I think when everybody has same amount of time, then why the difference between achievements is so huge. 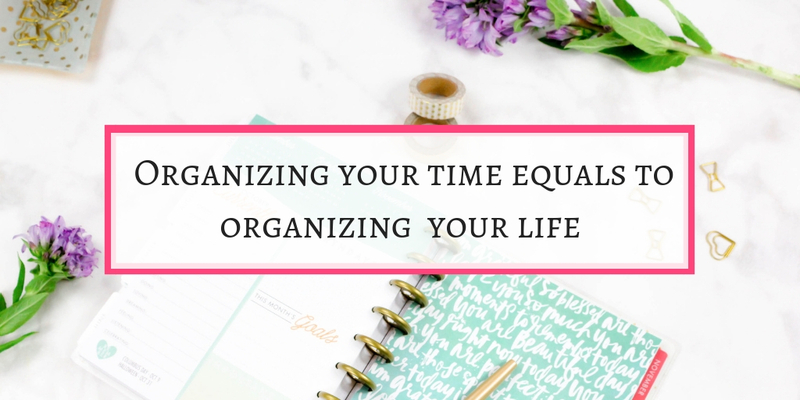 It all boils down to time management or organizing your time. Although, there are many factors that play an important part in your success, managing your time is one of them. And it is the most important one. It really becomes difficult to organize your time if you will not pay attention to it. In this era of so many distractions, time goes in a wink. ‘Organizing your time’ sounds a simple term but it has a deep meaning. It requires determination, discipline, patience and a habit to bring your senses back to work every time you get distracted. 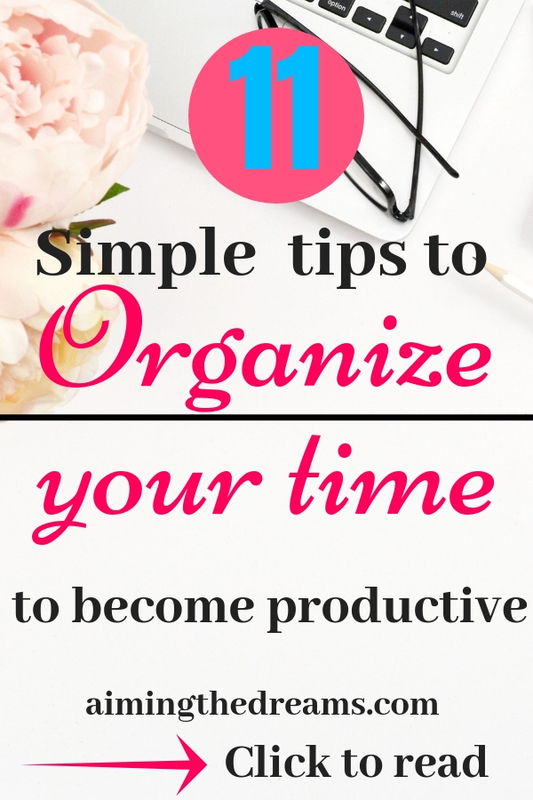 Here are some of very simple but effective steps to organize time and eventually be successful. Instead of doing everything together, it is important to concentrate on one important task, complete it and move on to another. It takes some time to gather all the information at one place by brain. If you juggle from one task to another, you waste lot of time. Because brain takes some time to adjust to new task. And as it is obvious, few of the tasks will have most of the effect on your success. Success brings money to you. It is like 80- 20 rule. According to Pareto principle, 20% of your tasks have 80% effect on your success. Concentrate on those 20 % tasks but one by one. I had this tendency to write too many tasks to complete in one day. Out of those tasks , I would accomplish few. The unaccomplished ones gave me a kind of discomfort. At the end of the day, I would feel bad about not accomplishing those tasks. Then I changed my traction of work. And started writing 2 or 3 tasks on my task board. I strictly concentrate on those tasks only. At the end of the day, I feel satisfied and happy. Experiment it yourself, write down just two tasks in your to do list and accomplish them. You will be surprised at the satisfaction you will be feeling after that. Some of the tasks you don’t need but they take majority of your time. One of the biggest time waster nowadays is checking your phone again and again. Think, do you really need to check it again and again. De-cluttering always help in moving forward and having a great successful time. In the absence 0f unwanted tasks, you will be able to concentrate on most important tasks of life. These important tasks will help you earn more but with less fatigue. Unwanted tasks are like clutter in your closet. All the clothes you are not wearing takes all the space and you don’t have space to keep your favorite ones. Same way if you are distracted by too many unwanted tasks, you will not be able to concentrate on required ones. See we all have only 24 hours. ‘Be aware of time and beware of time wasters.’ Do you like to be always in your dreams? For sometime, being in your dreams is perfectly fine. But if you always find yourself in the dreams of your future, stop and analyze your thoughts. There is nothing wrong with it, you need to visualize everything. But going overboard and only visualizing but doing nothing would harm your prospects of success. This quote from Shirley Temple is really an eye opener. Pick those activities which can help you in growing your wealth so that you can have time to spend with your loved ones or carry out activities which you love. The most important time is now. You will be surprised at the results you get if you take action NOW because this is the moment to start working towards your success. It is the first step which is most crucial. If you can persuade yourself to take action towards the task now, the next step would be much easier. As humans, we waste most of our time in thinking about the difficult tasks. Easiest way is, just do it. There is no other way to tackle difficult tasks. When you know what is the purpose of your current task, you will be obliged to accomplish that. See the end result. When you are setting goals, write down the end result in front of that goal. Goals may be small, but your end result would be your bigger task. Knowing your big result will help you in focusing on your important task instead of focusing on time wasters. This is my favorite because if I have to do something which requires lot of time and energy to complete, I would procrastinate it and pretend to be too busy for the said bigger task. But breaking into smaller parts let me do the important thing and reduce the time wasting tendency. Though it happens like you are doing very little but actually you are doing what is required and it will let you convert your time into actual money. Because whatever you are doing now will bring success and eventually money to you. As Peter Ducker said ” Efficiency is doing things right, effectiveness is doing right things.” It means you are so efficient that you will do everything optimally. All the activities never have similar effect on outcome of task. You have to figure out which ones are most effective for your given task. This will reduce time wasters and will let you concentrate on most important activities. It is very important . When you will reduce the unimportant activities, you don’t have to always feel busy. You would find yourself with lot of time to enjoy your life. Sometimes waiting for too long for a perfect time to start work, will let you procrastinate forever. This can be tamed by taking action now. As it is obvious that just learning about anything is not enough. You will get the required expertise only after getting through it. Same is with any task. As you will go, you will learn better techniques to do it. It is impossible to become perfect by only learning and not doing anything about it. This one is the most effective technique to manage your time and be efficient. When you know you have to complete any activity in particular time, you become more efficient. As Parkinson’s Law says, Work expands to fill the time available for its completion. When you know you have little time to accomplish it, you will try with all of your strength to complete the task in given time. According to Promodoro technique, concentrate on work for 25 minutes and take a 5 minute break as your brain is able to concentrate for short span of time and then it starts getting lethargic. You can use Promodoro Technique or use your own intervals according to your own attention span. Now , you have managed to do lot of tasks and going on the path of success, you need to celebrate your achievements. Attach your achievements with healthy and enjoyable activities. I am saying healthy and I mean it. Write down your activities in front of your tasks. Now you have activities as well as well as list of rewards. Accomplish your task and enjoy the reward and get ready for the next one. Organizing your time and life is important for success and eventually for getting money in life. 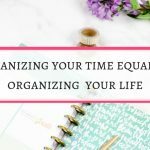 These are my thoughts on organizing time. What do you think about time and money ? Please comment and let me know your thoughts. If you like the post, please share it. I would be very thankful for this. Time management is what I struggle with every day. 24 hours is never enough for me and sometimes I wish we had 48 hours in a day. No matter how many tasks I tackle, there are always 101 things for me to do everyday. I’m going to take your advice to help me manage my time wisely. Thanks! Hey Jennifer, I am in the same boat.At the end of the day, I feel like so many things are left to do. Thanks for stopping by and reading. As a high school teacher, I see students check their phone at least 50 times in a 50 minute class period. I wish I could show them this post, especially your tip #3! Hi Shirley, this is problem with everybody. My husband cannot stay without phone even for 5 minutes. He checks phone so many times even if it is charging. Thanks for reading and commenting. Excellent article. And very timely for everyone who’s entering the busiest time of year! I especially enjoyed your first suggestion ‘Batch Your Tasks’, something I definitely need to apply. Also ‘Effective and Efficient’. I memorized it so I can use it as an affirmation. Haha. Thanks so much for the help and applicable advice! Thanks Carrie. Batching your tasks helps a lot. And instead of being efficient on every task, it is better to work on few tasks effectively. Organizing your time makes total sense to me. I find it difficult to really tune in on a task of I feel like there is an undefined amount to finish it in. Time blocking works best for me, when I know I have 20 minutes I can move mountains to get something completed. Yes Nicole, it happens like this. I we have more time , we just waste time.Thanks for stopping by and reading. Time management is key to our success in life. Very useful tips on how to manage our time and life generally. Thanks for sharing. Thank you John for stopping by and reading.